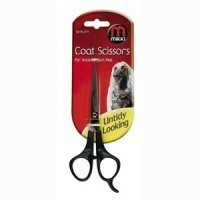 Mikki Coat Scissors are a great choice for keen grooming enthusiasts. A great quality product, these scissors allow you to keep you pooch in tip-top condition! The scissors are a pleasure to use; the handles are comfortable to grip, with a curved finger rest for steadier cutting. The micro-serrated edges of the blades ensure accuracy and prevent any slipping, especially when the hair may be wet. Like all Mikki Products these scissors are long lasting. The heat-treated stainless steel blades are designed to retain their sharp edges with minimum needs for sharpening. The perfect choice for proud pet owners!